Summer is almost here (for those of us in the Northern Hemisphere!) and most of us are already out on the water, enjoying increasingly warmer practices. We’ve dusted off our gear and are repairing or replacing equipment. We’re looking for new and better items that will help make our time on the water and at regattas more enjoyable. I’ve made a short list of items I love and recommend for your summer wish list. These are things that I have recently discovered and fallen in love with, or I have used for years and cannot do without. I hope you find them as fabulous as I do! For me, the ugo is a very recent discovery and it is the phone case of my dreams. 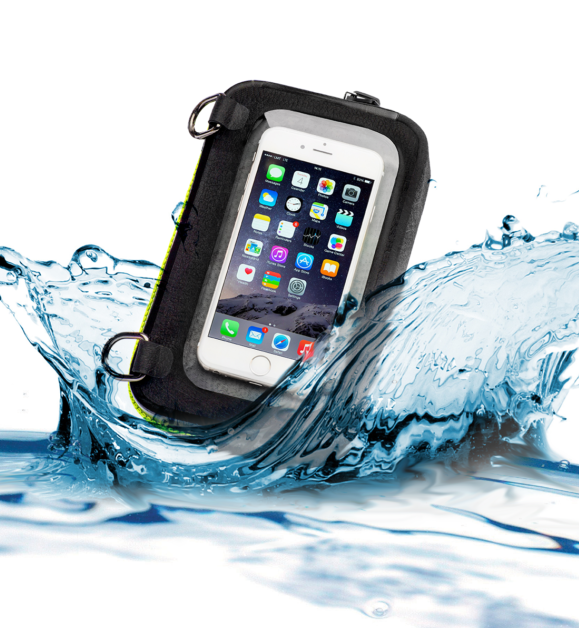 It’s not just a waterproof phone case, it also FLOATS! I can’t tell you how many times people have said to me, “Oh, don’t worry, my phone is waterproof!” and I ask them, “But is it sink-proof?” I can tell that they hadn’t even considered the fact that if they drop their phone while out on the water, it will sink in the blink of an eye. I’m always overly paranoid about having my phone on the boat because I worry about it sinking straight to the bottom of the ocean/river/lake, never to be seen again. I first saw a ugo while coaching at the Bow Wave Camp last April. Megan, one of the other coaches, had one and I asked her what the heck it was, as I had never seen anything like it. I started calling it her “boat purse” because it also held a bunch of important things like money, lip balm, credit cards, a car key, plus the phone (you could call it a “boat briefcase” if it makes you feel better, though). Megan showed me all the awesome features of the ugo and then she said, “Check it out…” and tossed it in the water. It floated! Like it was wearing a pair of child’s arm floaties, her ugo stayed right on the surface of the water! I was sold. I’m not going to lie, at first I though that the ugo was a bit pricey (though you can get a 20% discount on your new ugo by entering discount code PADDLECHICA). But then I started doing the math (because I’m a bit of a math nerd, for those who know me). A quality waterproof case costs somewhere in the range of $50-150 USD. Enhancing it with some type of floatation device designed for the case is an extra $40-80. And when you upgrade your phone, you have to purchase a whole new case and floatation device because phones are all different sizes. Over time, I have bought three different iPhones. That means I have bought three different rugged, waterproof cases for them. I have easily spent over $250 in phone cases, and not one of them floated, so I still ran the risk of dropping my expensive phone and its lovely case to the bottom of the ocean/river/lake. Replacing an iPhone costs at least $300. So, yeah, the ugo’s price was looking more and more attractive because it fits phones of all sizes and it FLOATS! And then I took a look at the inside of Megan’s ugo. For me, this was the added “wow” factor. It had slots for credit cards, a zippered area for a key or money, two holders for lip balm or eye drops, and other handy sections. It’s like a wallet! But it is also big enough to hold something like an EpiPen or an inhaler. So, all of those things you’d like to (or need to) take with you when you are paddling OC, on the dragon boat, or on the SUP can fit nicely in the ugo and if the boat flips or you fall in, your precious possessions won’t end up at the bottom of the ocean/river/lake, never to be found again because…have I mentioned that it FLOATS? Sure, you could throw all of that in a drybag, but if the boat goes over, your drybag will also sink to the bottom. But wait, there’s more! You can actually use your phone while it’s in the ugo. You can talk, text, and even take selfies. And if, while you are texting that selfie to your teammates who didn’t come to practice and missed that amazing sunset, your ugo slips out of your hand and falls into the water, no worries because it FLOATS! (I really don’t think they mention this enough on their website, but I’m so excited about the fact that it floats, so I’m going to emphasize it now). And yes, you could keep the phone in a drybag, but you can’t actually use the phone while it’s in the drybag, so when you take it out there is the distinct possibility that you will either get it wet or drop it in the water. If you order from the ugo website and enter the discount code PADDLECHICA, you will save 20%! European paddlers can go to: this site to order their ugo (sorry, no paddlechica discount, but the price is already nice and low for you!). And paddlers in the Toronto or Ottawa area can get in touch with me directly to purchase a ugo with no added shipping costs. I received this Holdfast grip a few months ago, but only recently was able to try it out on my paddle. I love it! I’ve used wax and Gorilla Grip for years, but I was tired of the sticky gunk being on my hands all the time, plus I wasn’t always good about remembering to bring it on the boat with me for reapplication during training or before races. And if I forgot it, I was out of luck. I have tried other grip tapes in the past and never liked them, usually because they were too thick and didn’t give me a good feel of the paddle shaft in my hand. I like to feel my connection to the paddle. This grip is different. It has thousands of tiny, soft, flexible gel-like fingers that provide excellent grip without the need for wax or gloves. This photo shows a paddle with all three colors on it – pink, clear, and black. All you have to do is clean your paddle shaft well, then follow the easy directions on how to stick the HoldFast grip in place, and voila! You have a great new grip on your paddle. It doesn’t come off unless you peel it off, so make sure to put it in the right place, but they send very explicit instructions and even have a video on how to place it correctly, so you can’t go wrong. You also get a HoldFast grip for the handle of the paddle, but I haven’t used mine yet – I have never had an issue with grip there, thankfully. But it’s nice to know that it’s available, if I need it! First off, I should tell you that I haven’t actually used one of these myself. But, I have seen people using them and have been jealous that they had one and I did not. So now the Under the Weather pod is on my wish list. Imagine those cold, rainy regattas where everyone is soaked to the bone and huddling under one small 10′ x 10′ tent which is also piled with the team’s gear so that your bags don’t get soaked. Now imagine your own personal tent that pops up in seconds and has enough space for you, your chair, and your gear. Or, if you have the XL pod, there is enough space for you and your stuff plus a friend and his or her stuff. So you won’t be lonely while you wait between heats, but you will be nice and dry. Originally created for spectators on the sidelines of sporting events such as soccer, softball, or football games, this product was featured on Shark Tank earlier this year. Not only is it designed to keep you warm and dry during wind, rain or snow storms, but it also provides shade during the summer months, helping to reduce your sun exposure. It comes in loads of fun colors and has ground stakes and a handy carrying case that you can wear as a backpack. How easy is that for taking to regattas? This is a great way to stay warm and toasty while the other teams are shivering in the wind and rain. Helinox makes an amazing line of lightweight, portable chairs. Big Agnes is a roomier chair that comes in many colors. A few smart paddlers traveled with their Helinox chairs to our race in Puerto Rico and it barely took up any room in their luggage. As it says on the Amazon site, the Helinox Big Agnes folds down to 14″ x 4″ x 5″ and is “smaller than the Sunday Times.” And at 1.9 pounds, you certainly don’t have to worry about lugging a heavy chair anymore. Similar chairs found on Amazon may be a bit cheaper, but they are also heavier and less durable. I love the fact that you can take this chair anywhere, including to out of town races, with barely any added weight. You all know how much I love my Hornet paddles. Not only are Hornet’s designs beautiful and creative, but their paddles are also lightweight and durable. I love the modified T-grip. I use to struggle with a palm grip because it just felt too big and bulky for my hand. But the traditional T-grip with defined edges on the ends of the T gave me odd blisters in my palm. The modified grip is a great cross between the two. It is a rounded T-grip that fits well in your palm and allows you to have a solid grasp on the handle. The edge of the blade is reinforced with solid fiberglass for more durability, yet the paddle is only 12.5 – 14.5 ounces (depending on the length you select). I love the way my Hornet paddle cleanly enters the water with its sharp blade tip. Hornet paddles deliver performance with individuality at an affordable price and you can even get a discount when you enter the code PADDLECHICA. I first bought my two Takeya water bottles last year and I love them. I can put 40 ounces of ice and water in one of these bottles and 24 hours later there is still ice in it, which is perfect for those hot race days. Or, if you see that the weather will be not-so-sunny for your weekend race, you can fill it with hot tea or coffee and it will stay warm for at least 12 hours. I bought a two-pack and I am so glad I did! Note: my two-pack came with one blue bottle and one silver bottle. I have found that the blue one stays colder even longer than the silver one. I’m not sure if the colored coating around the bottle helps insulate it or not, but if I were to only purchase one bottle, I would order it in one of the great colors they have (blue, pink, white, black) rather than the silver one. I can see that puzzled look on your face right now…why on earth would I be recommending a clothesline? I actually would have never thought to share this with you except that two weeks ago at a regatta I was using my clothesline to dry my wet gear and one of my teammates said to me, “You have all the cool stuff! Where did you get that?” And so I realized that I should share my great find with the rest of the dragon boating community. After each race, my clothes are soaked, especially when I race on a mixed boat. It is nice to be able to change into dry clothes and hang my wet gear up to dry in between races. I used to just flop my clothes over the back of a chair or whatever I could find. But then I started bringing a clothesline to the race site and it has been great. Hanging clothes up gives them that added ventilation that allows for proper drying, which means that your race gear will dry much quicker. This type of clothesline can be hung between any two fixed (or semi-fixed) objects: trees, fenceposts, tent poles, etc. You can even stretch it between two chairs as long as you put some heavy gear in the chairs to weigh them down. And, this clothesline requires no pins to hold up the clothes. You simply poke them through the spaces in the twist of the bungee and the tension holds the clothes in place. So, this is great not only for local races, but also for out of town races because with no required clothes pins it barely takes up any room in your bag. Plus, because of the way the clothes hang on it, you can fit loads of jerseys on it at the same time, which means that your teammates will be happier in their dry clothes as well. A quick note that while I have done a lot of research on this particular product, this is not the exact clothesline that I own. I was lucky enough to have a friend make one for me. You could certainly make your own by purchasing 1/8 inch bungee cord and two carabiners. You could even get the cord in your team colors! Mine is braided (like the one pictured below) instead of twisted (like the one pictured above and linked to), but it is the same idea of using the tension to hold the clothes in place. I first saw these water shoes a few years ago and was intrigued by their design. I finally bought a pair last year and I have been so glad. Vivobarefoot Ultra 2 Water Shoes are made from a very lightweight synthetic material (Ethylene Vinyl Acetate) that is similar to what Crocs are made of, but these shoes are more streamlined and less bulky. So, with no fabric to get wet, you won’t have that awful odor that most shoes have after a while, and you won’t have to to worry about your shoes taking ages to dry. The hexagonal holes allow your feet to breathe so you don’t end up with that foot funk at the end of the day. The sole is thick enough to protect you, yet thin enough to let you feel your connection to the boat. They come in a variety of colors and, after a day of racing, leave you with some seriously fun tan lines. Training sessions and regattas can be brutally hot during the summer months, so I use Vega Hydrator as a way to keep hydrated and keep my electrolytes up. It is plant-based, gluten-free, and vegan, and is certified to be free of substances banned by the World Anti-Doping Agency. Just add a scoop to your water bottle and it not only makes your water taste better, but helps replenish lost electrolytes and minerals due to all that sweating in hot weather. I like the lemon-lime flavor better than the berry, but they are both good. Thank goodness for the TV show Survivor, otherwise we might not have seen a rise in the popularity of the Buff. A Spanish off-road motorcyclist, Juan Rojas, wanted something he could wear on and around his head in all conditions. This multifunctional tubular-shaped piece of fabric is most commonly worn as a headband or neck scarf, though there are many different ways of wearing it, as shown below. I love them because they offer 95% UV protection and come in so many amazing colors and designs! I found so many different ones, that I had to give you the link for even more here! The half Buff is my personal favorite. It’s half the length and most functional as a headband, but still as wonderfully protective and practical. You can see that the Outer Harbour Premier and Senior Women love to wear our Buffs! Now that it’s warmer, I wear my Buff to keep those little wispy hairs out of my face, and to protect my forehead from getting sunburned while paddling. But in cooler weather, it is great for keeping my ears warm, also. As you can see in the photo, many of my teammates enjoy wearing their Buffs, too. You can read more about the history of the Buff here. So, there are 10 things that I think will help make your paddling season even better. What are some things that you can’t do without? I’d love to hear! Love your posts they are very informative. Just a heads up on the water shoes, you said they are similar to the Crocs material. I have a pair if Crocs shoes and put them in the car. It was particularly hot one day and the car heated up after about 4 to 5 hours I changed my footwear and found the Crocs shoes had SHRUNK! They shrunk a good foot size so now I can’t wear them. Don’t know if the water shoes you posted about would be susceptible to shrinking too. Thanks for the heads up, Elaine! That would be awful to find your shoes a size smaller than when you left them. I’m not sure if the Vivobarefoot shoes are the exact same material, but I will certainly be careful with mine. I usually leave them in the trunk, and often for days in the Miami heat, but not in direct sunlight. However, it’s definitely good to know that shrinkage might occur! Thanks for reading, and for your kind comments. I am looking to purchase a paddle. Where do I get one? I am in Ontario. The website is only in the US. Thanks for reading Shelley, and for your question. In Canada, I would suggest Paddle Zone: https://www.padlzone.com/. They typically have booths set up at the larger regattas, as well as an online store. Best of luck and I hope you enjoy your new paddle!